This entry was posted on January 23, 2017 by Van Rental. The all-new Volkswagen Crafter is now available to order from UK Volkswagen Van Centre dealers, with prices start from £23,920 +VAT. The model will receive its UK launch at the CV Show in April. First deliveries are expected in May. The new Volkswagen Crafter is now available to order in the UK. First deliveries are expected in May 2017. Unlike previous models, the new Crafter is not based on the Mercedes-Benz Sprinter. It’s an all-Volkswagen effort on a new platform and will also be sold under the group’s truck-focused MAN brand. All variants will be powered by a 2.0-litre TDI (Euro 6) diesel engine which Volkswagen says has been developed specifically for commercial vehicles. The point here is that previous versions of the Crafter were powered by VW engines lifted from the group’s large cars and smaller vans. They sometimes lacked pulling power when heavily loaded — something Volkswagen says won’t be a problem with the new model. Up to four choices of power output will be available — 102, 122, 140 and 177 PS — depending on the variant selected. Buyers will be able to choose between front, rear and all-wheel drive models featured VW’s 4MOTION system. Manual and automatic gearbox options will also be available. Up to three different vehicle lengths are available, depending on the model chosen: 5.9 m, 6.84 m or 7.39 m. Panel van variants also come with one of three different roof heights: 2.35 m, 2.59 m or 2.79 m.
In line with the Caddy and Transporter ranges, three trim levels will be on offer — Startline, Trendline and Highline. Prices will start from £23,920 exc. VAT for the basic Crafter Startline. For more detailed pricing or any other queries, contact your local VW Van Centre dealer. 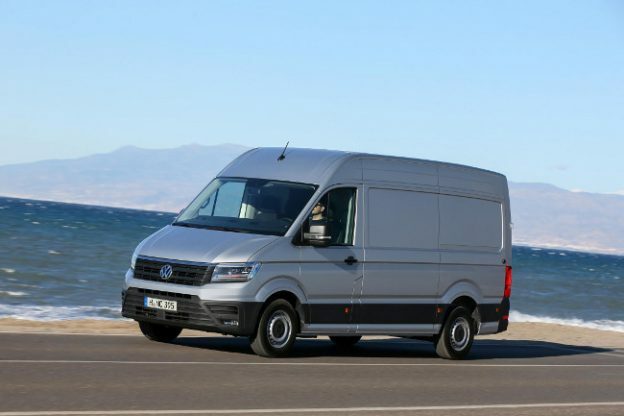 Will the new Volkswagen Crafter be a Sprinter beater?